For a pause-resisting historical romance novel brimming with Regency England’s rakish dukes and rapscallion lords, buy this passionate adventure sprinkled with suspense and humor. You won’t be able to put it down. 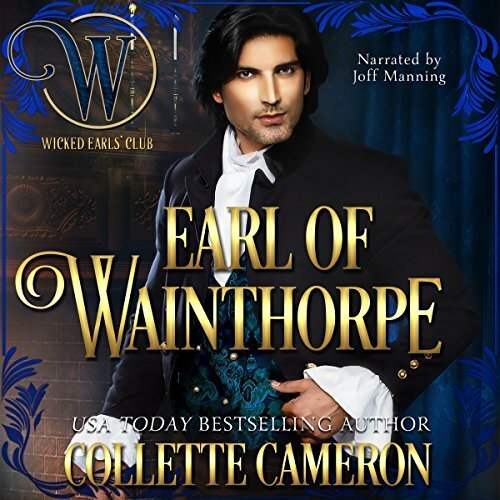 This was my first Collette Cameron novel and my first introduction to the Wicked Earl's Club. It works well as a stand alone story. It is quite a charming read. Pierce is a very endearing character and not wicked at all. I enjoyed the activity surrounding the bet at the beginning of the novel and Bianca's interactions with the earl's sisters. However I would have liked more drama or suspense with Bianca's cousin, Fairfax, to liven up the story after Bianca becomes the earl's ward. I loved the narration. I thought that the characters were all excellently performed and it was very easy to listen to. I would definitely listen to more books performed by Joff Manning. This was a lovely Regency romance and I would look forward to reading more by the author although I found it annoying that American words were used instead of English e.g diapers. The inaccuracies annoy me as they have the immediate effect of pulling me out of the story's time and place. The phrase 'didn't have a pence' rather than a 'penny' also stood out.